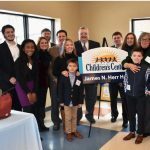 ERIE – Sarah A. Reed Children’s Center held a dedication ceremony for its newest residence hall for at-risk children on Saturday, January 19, 2019, at the Center’s main campus in Millcreek Township. This new 12-bed unit is the fifth residence hall at Sarah Reed’s Residential Treatment Facility, which is expanding due to an increasing need for intensive 24-hour care for children ages 5-18 with significant psychiatric and/or trauma related challenges. The new James N. Herr Hall will serve 25 children each year, bringing the overall impact of the Residential Program to approximately 70 children annually. Board members, administrators, project donors, community supporters and members of the Herr Family attended the dedication ceremony, which included remarks from James D. Mando, president and CEO of Sarah Reed; Thomas Hagen, chairman of Erie Insurance; James Gavin, president of Community Care Behavioral Health; and Patrick Herr, director of Community Impact at The Erie Community Foundation and son of the late James N. Herr. Guests also enjoyed a tour of the new facility following the official dedication of the building, which was given by Richard McCarty, Ph.D., associate professor of Religious Studies at Mercyhurst University. The $1.2 million residence hall was funded through the generous support of many corporate, foundation and individual donors. Lead donors include UPMC Health Plan and Erie Insurance, which each made a $200,000 major gift to the project, and B&L Wholesale Supply Co. contributed a total of $100,000 through their golf tournaments held annually in support of the Center. A time capsule will be placed inside James N. Herr Hall and is scheduled to be opened during the 200th Anniversary of Sarah A. Reed Children’s Center in 2071. The time capsule includes special notes, artwork and various commemorative pieces that were created by the children, Board members and staff. Guests in attendance also had the opportunity to participate and be part of Sarah Reed’s rich history. Serving the Erie Community since 1871, Sarah A. Reed Children’s Center is a leader in the successful care and treatment of children with mental health, behavioral health and severe emotional challenges. For more information, visit www.SarahReed.org.